no comment, mais, sanctions exemplaires ! 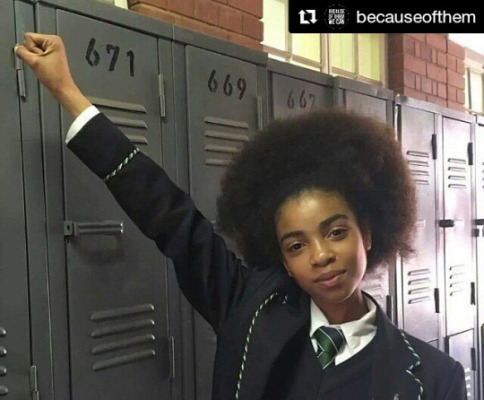 Zulaikha Patel (c. 2003- ), a South African schoolgirl, was punished by her school, Pretoria High School for Girls, for wearing her hair in an Afro. She had changed school three times because of her hair. This time she led a protest against the school’s racist rules. « My sister has gone through a lot of bullying, she’s had to change school three times because of her hair. Other children would laugh at her and say, ‘Oh my god, your hair looks like a cabbage’. It broke my heart. « She’d cry everyday when I picked her up from school. She’d get home and cry because of how she was treated because of her hair, and say that the school said her hair is a distraction and called it exotic.